Choose from our extensive range of vessels for holiday or commercial activities. The Charter Boat Centre Cairns caters for activities such as Cruising, Luxury cruising, Snorkelling, Heavy Tackle Marlin fishing, Light Tackle Game, Light Tackle Sport ,Lure and Fly fishing, and Scuba Diving, on private charters only, in the waters off Cairns, Port Douglas , Cape York, for share ,private , corporate, holiday individuals , and special interest groups. Our area of speciality lies in the far northern region of Queensland, Australia on the Great Barrier Reef from Cairns to Port Douglas , Cooktown , Lizard Island & Cape York , East & West Coast. We can also source vessels for the making of feature films, television commercials and documentaries, marine research and scientific expeditions, conservation studies and government agencies. 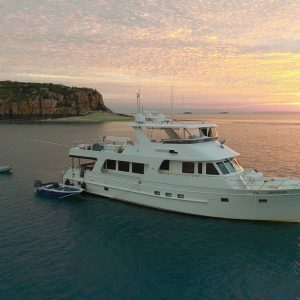 Large or small charters, cruising, fishing, snorkelling, 1 day to over night or extended. We will try and arrange the charter that suits your requirements.